Big Wheel Building: There are many like it, but this one is mine. There are many like it, but this one is mine. Notice I didn't call it my "XC" bike. Nor my "AM" bike. Nor racing bike, nor DH. It isn't limited to any of these niches, largely because I don't want it to be. If I'm going riding, 80% (probably more) of the time this is the bike I choose. It is a LenzSport LunchBox: 29" wheels, 6" rear travel, 17.2" chainstays. 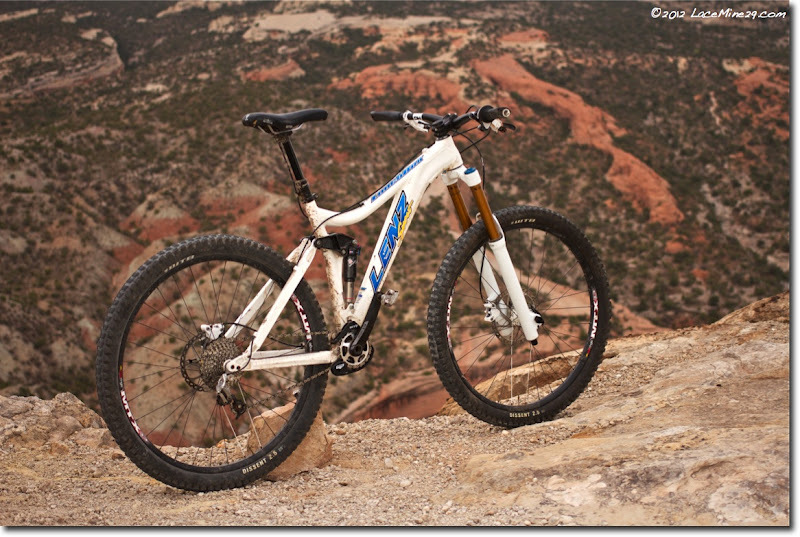 I ride it locally (Western CO) as well as in Moab, St. George, Sedona, The Swell, Phoenix and Tucson--and many other fun and chunky places. 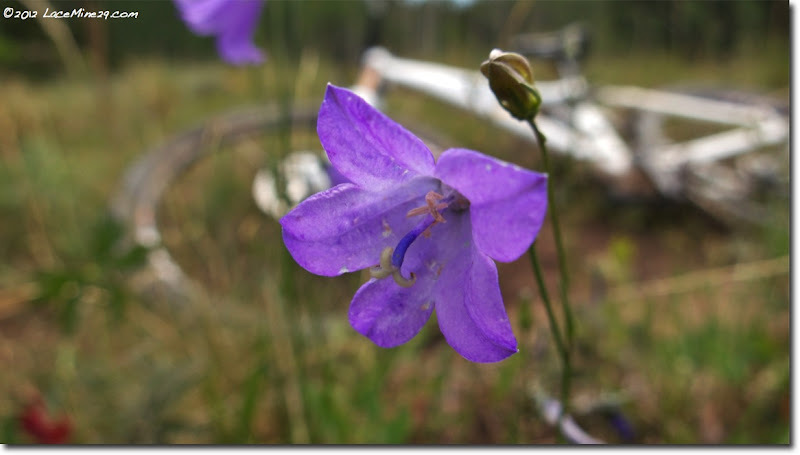 I've ridden this bike on all-day chunk epics in the above locales, as well as lift-served at Crested Butte, Keystone, and Winter Park when the mood struck. It's served me well on Vancouver's legendary North Shore, Whistler's tech-epics, even at Colonnade, Galbraith, and Oakridge. Why is it so versatile? It starts with one simple thing--taking the notion of weight (bike weight, wheel weight, tire weight--all of it) and throwing it out the window. There--I said it. Weight ain't important unless you're racing, and even then it's a teeny, tiny fraction of that which determines overall speed. Since I ain't a racer (and can hardly remember when I was) it makes no sense to fixate on something so irrelevant. Once that niggling detail is gone, you can focus on blending versatility with pure performance. This is my idea of the ideal 'one bike'. The 'brain' is this MRP single ring setup. 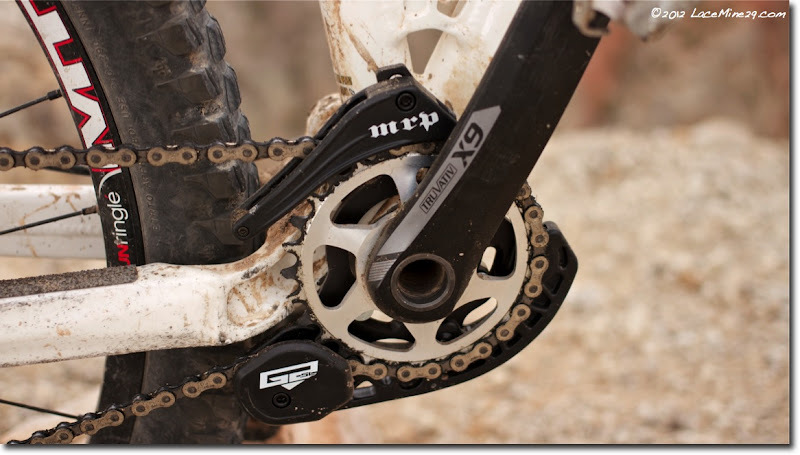 That ring is retroed onto some hand-me-down X9 170mm cranks, but (I think) it'll work on most other SRAM cranks too. 28t seems to be the best compromise for uphill and downhil, for me. I used to be an adamant believer in the need for a granny ring, but our local head-in-the-sand trail "advocates" are systematically removing anything steep and/or fun from our trails, so 1x is suddenly plenty. I like the simplicity and size of the MRP ring/guide package here--and I really like how quiet it is. Unnoticeable on the bike, except if you accidentally reach for a front shift. 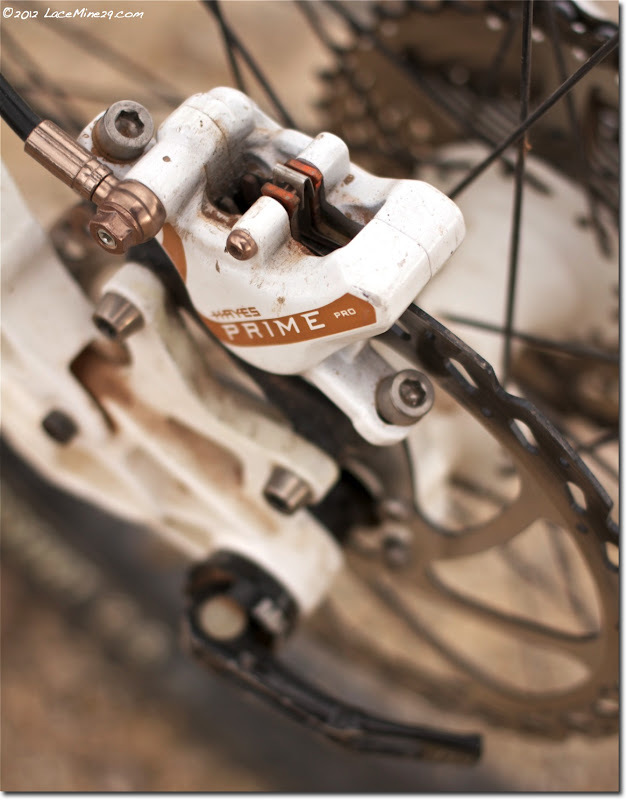 Hayes Prime Pro stoppers, 8" front, 7" rear. Simple, powerful, one-finger modulation whether I'm creeping down steeps or feathering at mach ten. On-the-fly adjustability too--but I can't say I've used it since initial setup. 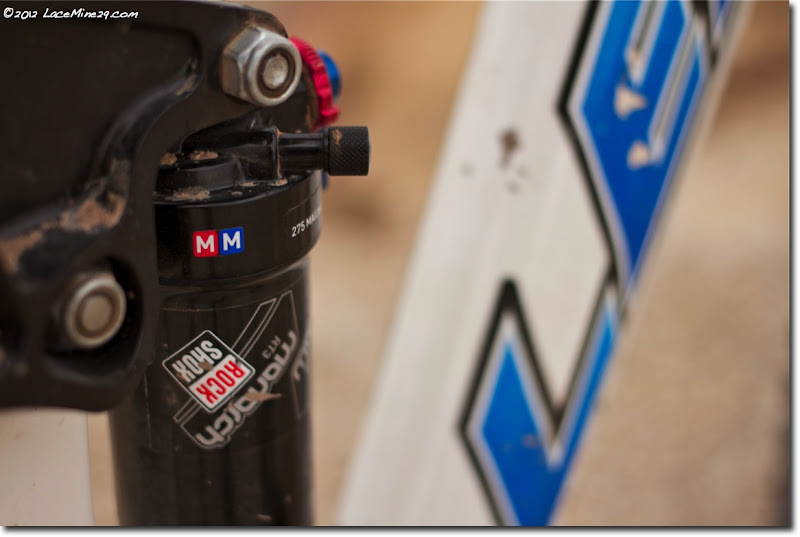 RockShox Monarch RT3 rear damper, MM tune. I sampled 3 different tunes on this bike before arriving at the MM as my personal ideal. I experimented with and ultimately liked the feel of the RWC needle bearing reducers, so although not pictured, they are on there. They give the bike a teeny bit of added small bump sensitivity, but change nothing in the damper's ability to filter and process medium to huge hits. Cockpit consists of ENVE DH bars cut to 770mm, Syntace SuperForce stem @50mm, Ergon paddles, and a 9spd Gripshift rear twister moving an X9 short cage der across a Shimano 12-36 cassette. Head shot. Fox 36 x 180mm fork sitting at full height. I milled the arch (or rather, I had he-who-would-prefer-to-remain-nameless do it) to accommodate a big wheel, then limited the travel to ~167mm internally. I've been waiting and waiting and waiting for someone, anyone to release a ~160mm travel 29" fork, even experimenting with an older dual-crown Dorado that didn't really scratch my itch. What pushed me over the edge to mod this Fox was the fact that *several* of my wheel customers had it done, some of them 3+ years ago. Some of these guys are 260# or more, riding LunchBoxes and similar, and have yet to have a problem with theirs. My only regret? Waiting so long to go this route. It is not appreciably stiffer than the prototype (and shelved) WB Fluid 150 that I rode previously, nor is the quality of the travel much improved. 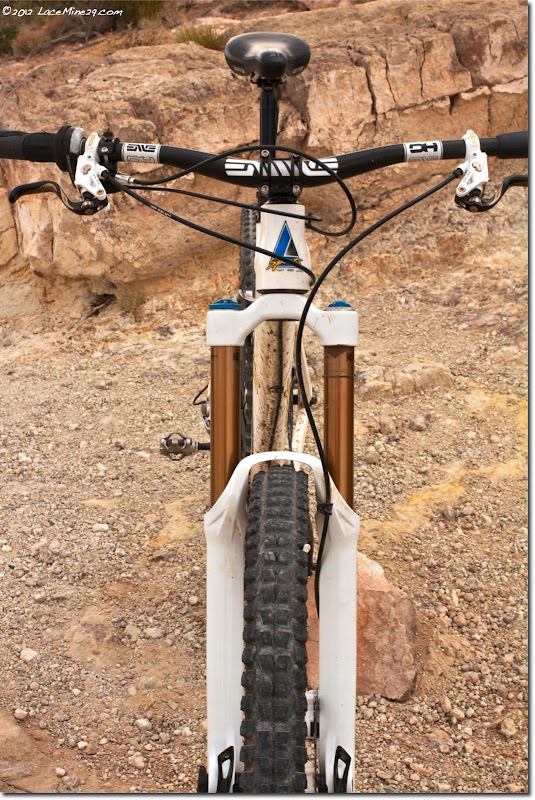 *BUT* it finally puts the geo of this chassis where it was designed to be--slack, with a BB just high enough to skim but not slam trailside chunk. I've been riding this fork hard for a year now and am finally beginning to see that it has limits. I haven't gotten to them yet--I can simply see that they exist. 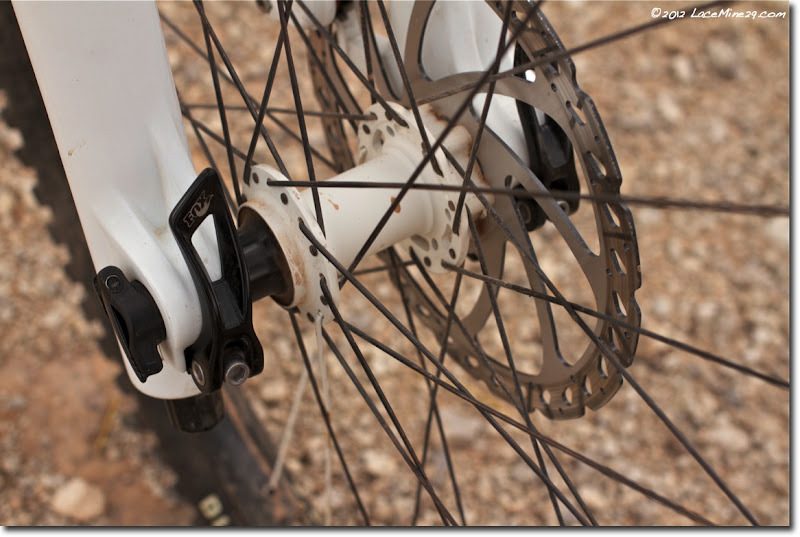 Hubs are DT Swiss 240s in 32 hole. Front is 20mm, rear is 12 x 150. Rims are Sun Ringle MTX 33--the gold standard for aggressive chunk riding with big wheels. Spokes are DT Competition, nips are DT Prolock alu. 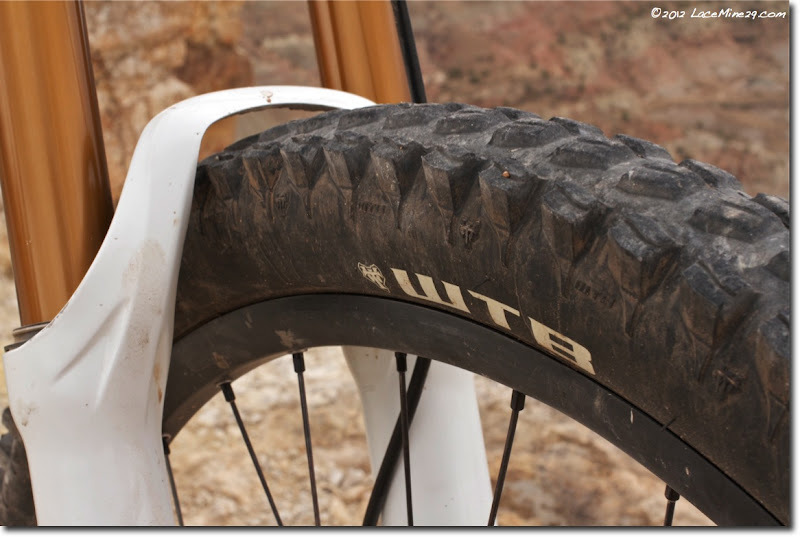 Tires are WTB Dissent 2.5 dual ply, with Bontrager 29" tubes. About 2.5oz of Slime in each tube. I typically run ~22psi up front and maybe 24 out back. Might go as low as 18/19 for super slow speed rock crawling, or as high as 25/27 for lift-served slamming. Never higher. I get 2 or 3 flats a year on this setup. 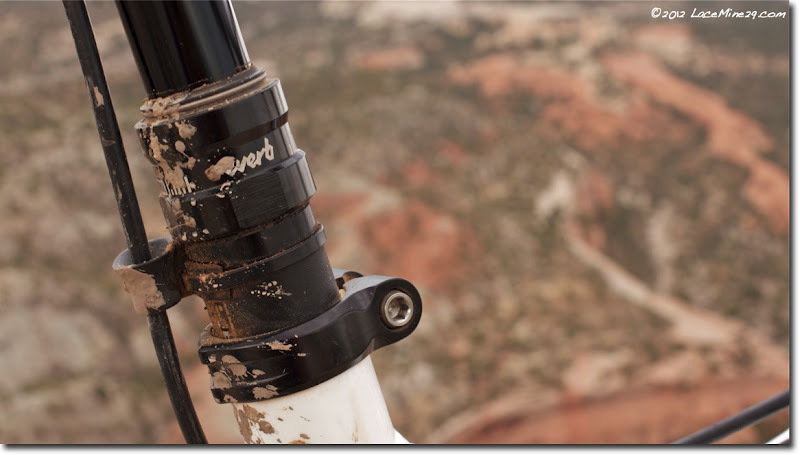 RockShox Reverb post with a WTB Aviator saddle. No matter who you talk to, everyone has heard a horror story about every brand of dropper post out there--myself included. I've owned and ridden the original Maverick and Gravity Dropper, then onto the Crank Brothers Joplin, then the KS i900 and i950, then the Specialized Command Post, and now this. They all have their compromises, this one seems to have fewer than the others so far. The ~20% of the time that I'm *not* riding this bike? I'm either on a weeklong DH bender in BC, or reaching for something "fat". A few times a year, usually while grinding out a multi-hour climb, I'll let my mind wander and try to imagine a way to improve this setup. 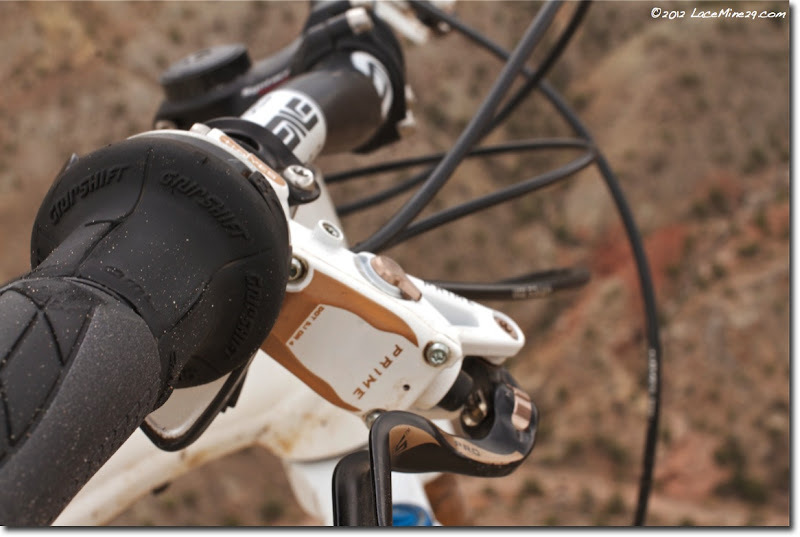 A purpose built 29" x ~165mm travel fork is about the extent of it. Beyond that I just want more time to ride it.